Construct with a given HeapIterface. is an entry in the heap? update an entry: change the key and update the position to reestablish the heap property. An efficient, highly customizable heap. The main difference (and performance boost) of this heap compared to e.g. 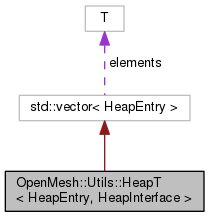 the heap of the STL is that here the positions of the heap's elements are accessible from the elements themself. Therefore if one changes the priority of an element one does not have to remove and re-insert this element, but can just call the update(HeapEntry) method. the HeapInterface telling the heap how to compare heap entries and how to store the heap positions in the heap entries. As an example how to use the class see declaration of class Decimater::DecimaterT.